...well at least some men that I know do (you shall remain nameless!) . After reading about Granville Millinery Company (from my home state of Ohio) I too want to find a reason to place one of those beauties atop my own head. The entire spread in O Home is absolutely exquisite. The artists's life seems so idyllic and quite dreamy actually. Look how gorgeous these hats are...and that paint color?! Very bold but I love it love it love it. Click here to read the entire article on the O Home website...or just borrow my copy! Caveat: In the Shop Guide they even indicate the exact paint color and brand so if you do want to replicate this look, you can! I too read this article in O and was so inspired by their life and how easily their work fits into it. I'm planning to take a trip down there this fall when the leaves are gorgeous! That's the green I put on an accent wall in my house and in my dining room! I love it. 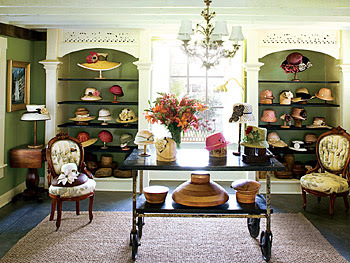 If we can get invited to the Kentucky Derby we'll have a great place to wear a hat!